Well that was fast! MSNBC president Phil Griffin announced Sunday night that "Countdown" host Keith Olbermann will return to the air on Tuesday. The announcement comes just two days after he was suspended "indefinitely" for contributing to three 2010 candidates without prior consent from the network. "After several days of deliberation and discussion, I have determined that suspending Keith through and including Monday night's program is an appropriate punishment for his violation of our policy," Griffin said in a statement. "We look forward to having him back on the air Tuesday night." Olbermann's suspension jolted the media world Friday, leading to a flurry of coverage online, on cable news and even on the front page of the New York Times. Left-leaning supporters also got involved. Progressive Change Campaign Committee set up a petition to bring back the top liberal host on Friday. Within two days, 250,000 people signed up. There was speculation that Olbermann -- who's left several networks before -- might not return at all. And sources told Politico that Olbermann was suspended after refusing to give an on-air mea culpa. The suspension brought into the focus the ongoing tensions between the nonpartisan NBC News and the partisan hosts on MSNBC. Even though Olbermann is paid for opinion, the undisclosed donations presented a clear conflict of interest for someone who recently anchored an election night. MSNBC already received some criticism last week for having its liberal hosts and commentators anchor election night. So the news that one of them also donated to Democratic candidates only gave more ammo to conservative critics of the cable network. Among media watchers, the episode also raised questions about the current Olbermann-Griffin relationship. Olbermann has a reputation for being difficult to manage and once told the New Yorker that "Phil thinks he's my boss." Griffin put out only two short statements on Friday and Sunday. But MSNBC host Rachel Maddow -- who subbed for Olbermann and got her 9 p.m. show with his support -- devoted a segment Friday to Olbermann's suspension. Maddow talked of a double standard where Fox News allows Republican hosts like Sean Hannity and Mike Huckabee to take a role in politics that goes beyond journalism and into advocacy. For Maddow, the incident showed how MSNBC is different in suspending Olbermann for giving to candidates while Fox didn't take a similarly hard line when it came to Hannity's contribution to Michelle Bachmann. "Let this incident lay to rest forever, the facile, never-true-in-any-way, lazy conflation of Fox News, and what the rest of us do for a living," Maddow said. "Everybody likes to say, 'Oh, that's cable news. It's all the same. Fox and MSNBC, mirror images of each other.' Let this lay that to rest forever." Maddow continued: "Hosts on Fox raise money on the air for Republican candidates. They use their Fox News profiles to headline fundraisers. Heck, there are multiple people being paid by Fox News now to essentially run as Republican candidates. There is no rule against that at Fox. They run as a political operation. We're not." 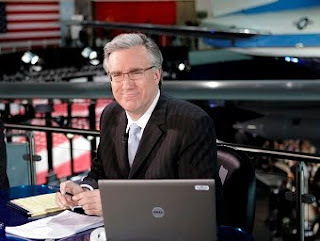 Olbermann, however, stayed silent after Friday's suspension. And he didn't respond to the rumors flying around all weekend. But on Sunday afternoon, Olbermann sent a message to fans on Twitter. "Greetings From Exile! A quick, overwhelmed, stunned THANK YOU for support that feels like a global hug & obviously left me tweetless XO"
Perhaps he'll have more to say Tuesday.